Creating strategies around how to deal with technology can become tiresome and futile. Technology is constantly at our fingertips for the majority of our days and, sometimes, nights. When we go to bed and wake up, virtuality and the Internet remain ubiquitously present. We may as well have our mobile devices tucked safely underneath our pillows for fear of being disconnected. If alien life forms were to descend, they may wonder how we obtain and retain our information. How do you describe looking into a backlit rectangular screen for approximately eight hours a day as a way to intellectually and emotionally digest images and contextualize your environment? From the world’s ugliest dog to the political and social upheaval in the Middle east to socializing online has become the way in which we obtain meaning about our environment. The anxiety and anticipation we feel to connect with others further adds to the way we function and re-create ourselves within language. In Christopher Baker’s work, Murmur Study, his installation showcases our collective meanderings through bringing physicality to our digital exchanges. As a 2012 ZERO1 biennial artist, Baker installed this iteration of Murmur Study in the back of the renovated and large exhibition space known as the ZERO1 Garage located in Downtown San Jose. The mottled, weathered, gray concrete that once served as a car repair shop now welcomes the footsteps of arts and technology patrons as well as curious newcomers. Baker reinvents micro messaging through circuitous wires and re-programmed thermal printers#. Far from reach, the printers are hung high on an exposed beam. Like soldiers at attention, they hold their post through the day and night without rest. Yet, the slow release of printed messages such as “That awkward moment when you’re eating fast food and some show about ‘how unhealthy the world is today’ is on tell…::whoops::?” provoke us to respond. Yet, the installation relies only on observation as the thin receipt paper cascade down and messages eventually reach eye level. 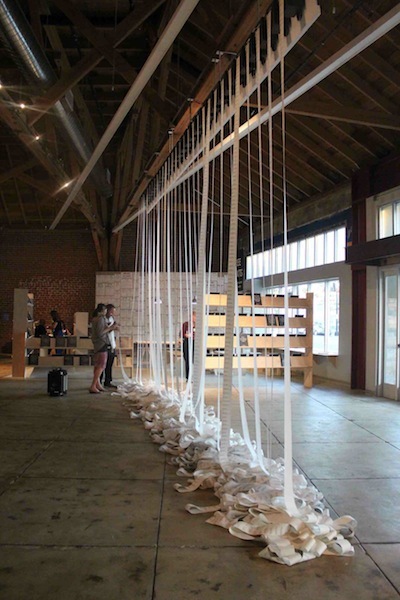 On the gallery floor, the paper accumulates resulting in piles that resemble white discarded shoelaces. During the rush of opening night, bodies passed curiously by the work. As visitors passed the installation, the papers slightly billowed and reminded us of their presence. Baker’s interpretation of our digital life siphoned from social media platforms into tangible form showcase our methods of thinking and communicating. Our thoughts, once untouchable, fall into the form of computation and transmission. The papers serve as remnants of our processing and constructions of everyday life. The work addresses the theme of Seeking Silicon Valley in that much of what we might believe is created in this technological region actually encompasses so much more than the physical location. Murmur Study captures the hashtags of our collective desires and beliefs, sometimes humorous and poignant, other times offensive and didactic. It reminds us that Silicon Valley is rapidly becoming way more of an idea than a tangible place. As one continues to read the papers in Baker’s piece, its easy to notice the stream riddled with vernacular and awaiting interaction. Although rigid, sleek, and so far up from eye level, the viewer is still able to see the thick, tangled wiring and circuitry behind the neatly hung printers. We watch slowly as one the most familiar objects in consumption dispenses information and data on how we might spend our time. On San Francisco’s bustling, highly trafficked Market Street, the organization Gray Area Foundation for the Arts (GAFFTA), is changing the face of arts and technology in a significant and dramatic way. Seeing a lack of representation in the digital arts movement accompanied by a profound interest in creating a space where such art could be seen, founder and Executive Director Josette Melchor created the nonprofit in 2009 in the midst of a financial crisis. Despite the downturn in the economy, Melchor dedicated her efforts to creating a space for both aspiring and established artists and creative technologists. From interactive artworks and data visualization to creative coding, this organization has become one of the most prominent spaces for arts and technology, fostering change and innovation not only regionally, but also internationally. At its core, Gray Area works with established artists such as Aaron Koblin and Camille Utterback to expose the public to software-based works that are both interactive and immersive through various tools of technology, such as programming, coding and data visualization. Integrating audio- and sensory-based controls, the works you might experience at a GAFFTA exhibition or event undoubtedly showcase most ingenious and experimental uses of programming technology and how contemporary art is created. Even donations to Gray Area have been made into a work of art. The nationally recognized and award-winning work Seaquence is a virtual art piece intertwined with a participatory aspect where donors are given a gift in return: a musical life form. Resident artists Ryan Alexander, Gabriel Dunne and Daniel Massey co-created this interactive music platform, forming multifaceted art to dynamically and physically enable donors to see their contributions transform within a virtual environment, thus becoming part of an even larger visual- and music-based system. Gray Area artists, technologists and faculty are constantly forging radical new ways to bring the community into the creation and discussion of the work. Although the organization can easily boast its tremendous creative talent, the exceptionally skilled faculty aims to teach novice technologists within the community both technical and artistic skills such as programming and electronics. The goal is to draw different sets of curious minds into the discussion and progression, bridging the gaps between arts and technology. Gray Area is particularly well known for weekend events called hack-a-thons, which gather creative professionals across multiple disciplines such as art, engineering, education, architecture, journalism and writing. These events facilitate the creation of mobile applications, with objectives such as fostering transparent communication between citizens and government officials. Hack-a-thon participants also produce conceptual artworks that transform public data into visually dynamic pieces. More recently, the nonprofit was awarded a $100,000 grant by the National Endowment for the Arts to put toward the implementation of a National Data Canvas Project. According to Gray Area, “The project will distribute data-driven art in urban environments across the United States and will include a mobile application for public use. Utilizing data.gov, the project will allow the general public an enjoyable and engaging way to discover new information through artistic data visualization and interactivity.” Essentially, the project will allow for artists, designers and developers across the nation to create works in their own region based on creative coding assembled by the San Francisco–based Gray Area team. Situated in San Francisco’s Tenderloin, Gray Area wanted to take part in the overall revitalization of the neighborhood by bringing some the city’s brightest creative talent to the district to assist in affecting change. As this center takes on even more demanding and worthwhile projects, there is one particular initiative that is both notable and eye-opening. The Creative Currency: New Tools for a New Economy is the latest initiative seeking to bring community leaders and organizers, politicians, artists and technology professionals together to affect change within a community with their collective skills. Photo by Ars Electronica ~ Click the image above for event details! Check out this opportunity to sit in on a web cast regarding the intersections of Arts, Science, Technology, and Society! I’m particularly excited Executive Director of ZERO1, Joel Slayton, will be participating on the panel, “Transcending Limitations: Two of the World’s Foremost Art/Science/Technology Curators Discuss Creativity at this Intersection and its Impact on our Future”. Details and links below! Transcending Borders: The Intersections of Arts, Science, Technology, and Society on a Global Stage. Join the live webcastfrom 5:00-7:00 PM EST at arts.gov and join in the conversation via Twitter at #neaartsci. This international dialogue around the nexus of art, science, technology, and society in the 21st century is convened by the Salzburg Global Seminar, the National Endowment for the Arts, and the Embassy of Austria in Washington, DC. Today’s artists and scientists improve our critical understanding of the world by provoking new ideas, experimentation, and creative strategies. This conversation will feature artists-scientists teams, along with policy makers and curators who champion their work, to examine the impact creativity and collaboration across these sectors can have to shape the world of today and tomorrow.